Well, there are still a few things to fix up in the test build so I'm not too surprised there's a problem. From the screenshot that looks as though it's crashed right at the startup. Do you know if they are connecting to X-Plane or have X-Plane running? Did the people who are getting this startup error ever use 1.4.4 test version successfully? Yep, no issues with the dev version just before. and no issues with the stable. I can't see why the recent changes would cause that. 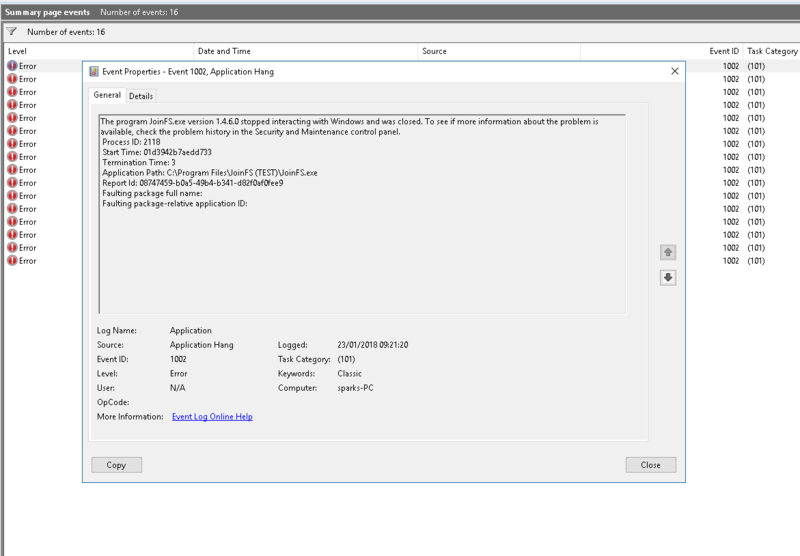 Are there any details in Windows Event Viewer, under Windows Logs/Application? Also, is anyone getting that error window but with an extra detail button that can be used to get information on the crash? Thanks for the screenshot. Could you try the following, please? 1. Run the stable version 1.4.3. 2. Open the monitor, View|Monitor. 3. Make sure the box in the bottom right is checked to record the log. 5. Run the test version 1.4.6. 6. Wait for it to crash. 8. Run the stable version 1.4.3. 9. Open the monitor, View|Monitor. 11. Post here the contents of log-current.txt.